The RD350 has been an iconic motorcycle from Yamaha, which we knew as the Rajdoot 350 in India. The motorcycle was in business in the country between 1983 and 1990, before being discontinued. But still after 27 years, it amuses riders and some customisation experts too. 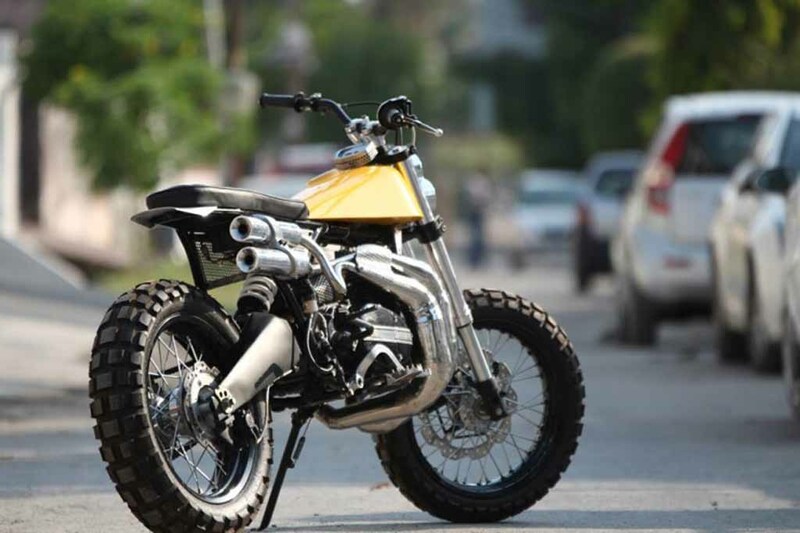 Here is one aggressive and mean-looking machine derived from the iconic RD350 modified by Moto Exotica and it appears wearing the Scrambler guise. 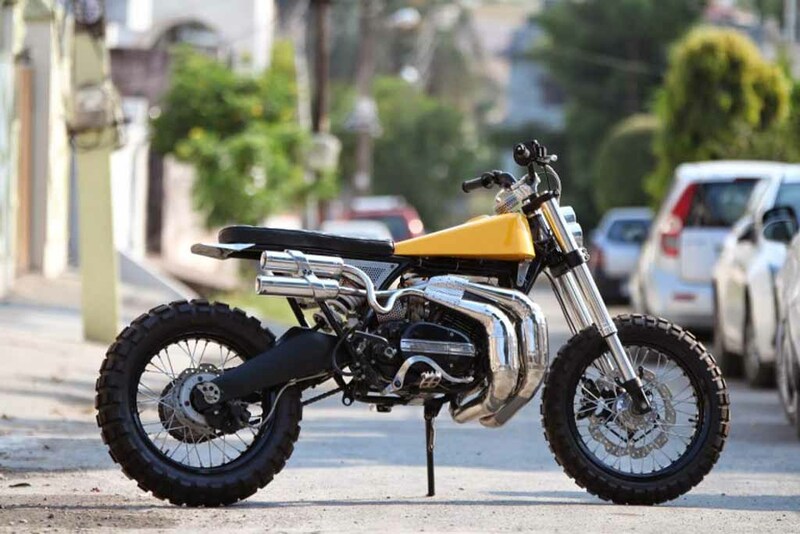 The Yamaha RD350 Scrambler comes with a very unique and eye-catching appearance compared to the standard model. It is nicknamed as ‘Eight’ and the motorcycle arrives very lightweight at less than 100 kg. In terms of design, up front, the Yamaha RD350 Scrambler gets unique shaped twin LED projector headlamps and a naked look. The fuel tank appears very sleek and complementing the bike’s slender look. Apart from that, the retro style flat leather seat and unique design higher positioned muscular stainless steel dual exhausts. The multi-spoke wheels wrapped in meaty off-road focusing TKC 80 tyres also grab attention very easily. 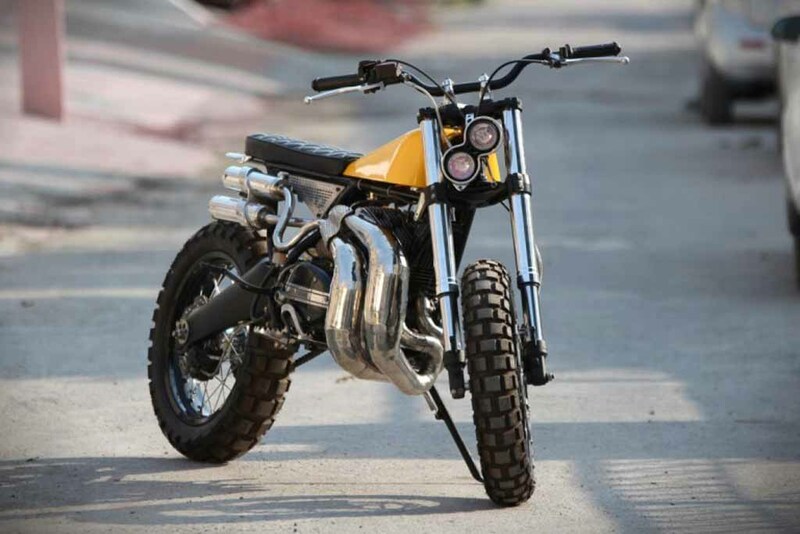 Overall, the entire custom motorcycle looks very attractive and interesting. 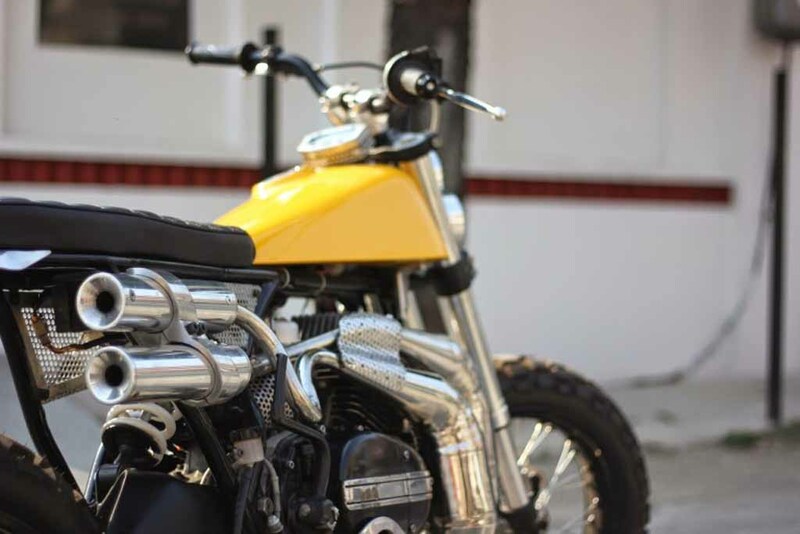 Power source for the Yamaha RD350 is a 347 cc parallel-twin, air-cooled two-stroke engine. The regular model was available in two different variants based on torque output – a high torque version and a low torque model. India-spec model produced 27 bhp and 30.5 bhp for the high torque and low torque versions respectively. It can reach top speed of 200 kmph. For braking duty, the Yamaha RD350 gets all new equipments replacing the old ones. Both the front and rear wheels sport disc brakes borrowed from the Honda CBR250R. The suspension setup has been borrowed from the KTM Duke 200. At front, it gets WP USD forks and rear sports WP monoshock absorber.